I couldn't stop reading with a sort of horrified fascination as everything unfolded. I was just so utterly engrossed in the story, with the sinking feeling that there was no way the situation Alex and Kate find themselves in could end well. It's very hard to talk about this book without spoiling it, but I must say that the major spoiler, the big secret, is mentioned at the end of the second chapter, a mere 14 pages in. (Plus my boyfriend picked up the book, took one look at the blurb, and guessed what the big secret was immediately.) I'm not sure whether it really merits being kept a secret in the blurb, and I'll talk more about this in the spoiler-y part of my review below. For now I'll try and keep it spoiler-free so that I might be able to persuade anyone who hasn't read this yet to read it and discover it for themselves! Because it's SO GOOD, and honestly the real fun of the book is not the big secret itself but finding out how this secret affects the lives of the characters. Clarke's writing style is simple but elegant, atmospheric and highly readable. I really immersed myself in what was happening and could picture everything clearly. The first half of the book is told from Alex's POV, and the second half from Kate's. Both characters had strong and interesting voices. I loved the setting of Edinburgh too; it was vividly utilised in the story. The characters were so deliciously complex; Alex and Kate both make some terrible decisions, and I really hated them for that sometimes, but at the same time I absolutely loved them as characters. They were just so incredibly compelling. They're good people, basically, but at the same time, they do things that have absolutely awful implications or consequences. The book deals pretty heavily with issues of consent (I'll elaborate on this in the spoiler-y section below) and with themes of sexual assault, which emerge as a result of Alex and Kate's decisions. I enjoyed the role that both Alex and Kate's families played. It's not often in YA that I find myself really caring about the teenage characters' families and seeing their parents as real people, but I definitely did that with this novel. 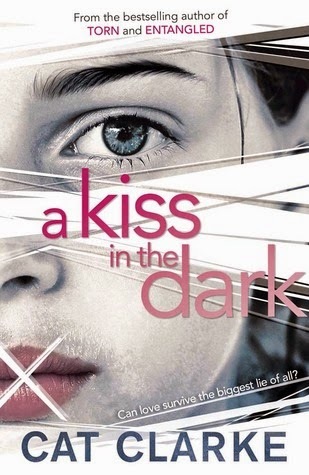 A Kiss in the Dark is at its core about love-- the things it drives us to do. Stupid things. Unimaginable things. The way it might turn into hatred. The strength and bravery it might give us. This book is an unexpected page-turner, thrilling and emotional. It's a love story through and through. A complicated one, but a love story nonetheless. And it's really beautiful. So, the big secret is that Alex is in fact a girl. Kate assumes that Alex is a boy from the start and Alex just never corrects her assumption, and then begins to make an actual effort at pretending to be a boy, by binding her breasts and so on. So this book, in the end, is about the love between two girls. And I kind of wish that could be revealed in the blurb, because it would make it easier for people who need these books to find them! And honestly the secret is revealed so soon and there's so much else to this book, building on that secret, that I really don't know if it's necessary to keep it a secret in the blurb. It's kind of a very uncomfortable read because there are issues of consent in that Kate only made out with Alex and trusted her because she thought Alex was a boy, but in the end Kate realises that she still loves Alex, even after she's found out the truth. It doesn't make what Alex did okay, but there is that. I think the one thing that could have improved this book for me would be if the author had spent a little more time on Kate's realisation that she still loves Alex. Alex the girl. There's not very much on this; if there had been more, the ending would have had a lot more emotional power. Instead, it's a little rushed. I just wanted to see Kate really think about what it means to love the real Alex. The book would have been a five-star read for me if not for this. But even so, it's a damn good book. I sometimes use a spoiler tag myself (the same one you're using, as a matter of fact), but when I do it, it's for bits of the actual review. I've never seen a review broken in two - the not-spoilery and spoilery parts - before. Clever idea! Yeah, I've realised I like to break it up into two parts, it makes it easier for people who don't want to read spoilers to get a coherent review from me! (: Glad you like the idea.